Face it, when it comes to pairing wine with food you have no idea what you’re talking about. It’s ok. Beyond the entry-level knowledge that red tends to go with meat (I think…right?) and white with fish, few people do (and I am not one of them). Indeed, there’s an entire profession devoted largely to understanding the arcana of this dark art: the sommelier. The problem is that sommeliers can be, in a word, annoying. The word evokes the specter of a tuxedoed Frenchman with his nose held higher than his forehead deigning to try, hopelessly, to teach us uncultured swine how to eat and drink and enjoy it. Which is why when, while having lunch at a vineyard recently, I heard sommelier Leslee Miller talking about pairing sparkling wine with her cheese puffs, my ears perked up. Cheese puffs? Here was a sommelier I speaking my language. 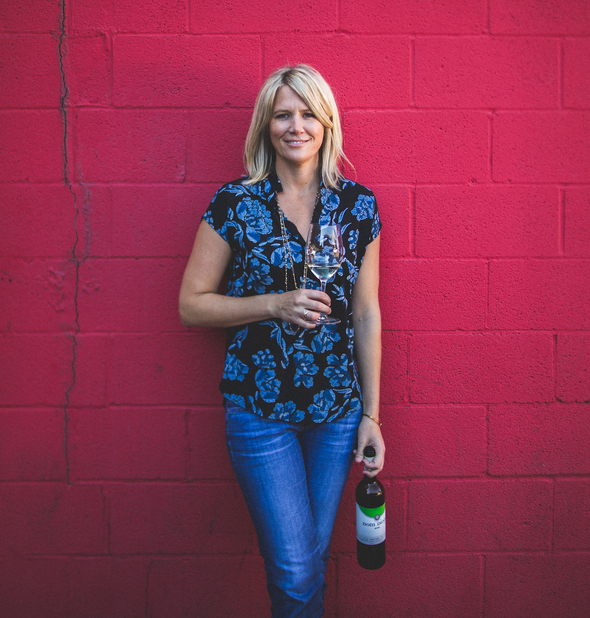 Miller is a som and wine consultant who sometimes works with the discount grocery chain Aldi to develop their shockingly affordable wines. Hoping to get a better understanding of how wine pairing really works, I picked out a few Aldi snacks and asked Miller to select wine pairings for them, and explain why. Green pea crisps -- Crystal Creek Riesling $5.99 -- I love bright green flavors (like the type you find in ALDI's green pea crisps), paired to Riesling. There's a really delicious subtle tone of juicy peach and pear from the Riesling that seems to harmoniously fit the green snappiness of these pea crisp snacks. White cheddar puffs -- Maison de Joie Sparkling Wine $11.49 -- Okay, if there's one rule that you need, here it is: if it's anything fried, crispy and in the chip-like category, then you're gonna need bubbles! I love the round toasty pancake, pineapple, pear notes that this wine exudes. Paired with the cheddar puff, the bubbles seem to effortlessly lift all the salty cheesy goodness off of your tongue, getting it ready for your next bite! Strawberry fruit strips -- Arosa Sparkling Moscato Rosé $5.99 -- Call this one party in your mouth! Sweet peach and strawberry cream tones of this sparkling paired to the strawberry fruit strips, make this a creamsicle explosion of sorts in your mouth! Freeze dried apples -- Broken Clouds Chardonnay $8.99 -- Think tropical pineapple, crème brûlée, vanilla and toasty brioche paired to these delicious apple treats. It's like your palate went on a luxurious vacation, but you never left home. We call this 'winning'! Popcorn -- Grand Mori Prosecco $8.99 -- Okay, I am an enormous fan of pairing popcorn to anything sparkling. But here, the really gorgeously layered rich notes behind our Grand Mori Prosecco are the perfect combo to ALDI's delicious popcorn. Marzipan, caramel and creamy fruit make this pairing to our popcorn really quite magical. Pistachios--Lot Series #14 Garnacha $8.99 -- Cherry, blackberry & violet are the notes that I love from our special Lot Series Garnacha. But when paired to ALDI's pistachios, a third element arises: texture! I love this really fun + delicious layered combo. Bits of earth and spice appear, creating a whole new element of YUM!